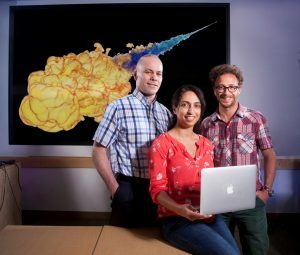 About the photo: Sandia National Laboratories postdoctoral researcher Layal Hakim, center, working with Joe Oefelein, left, and Guilhem Lacaze, designed and implemented an optimized chemical model that describes autoignition of a diesel fuel surrogate. Researchers at Sandia National Laboratories have developed a model for how diesel engines autoignite that should lead to increased engine efficiency and a better understanding of how pollutants form. Sandia postdoctoral researcher Layal Hakim, working with mentors and Sandia principal investigators Guilhem Lacaze and Joe Oefelein, designed and implemented an optimized chemical model that describes autoignition of a diesel fuel surrogate and quantifies the degree of uncertainty in the model. Understanding the fundamental processes that produce autoignition can lead to designs that improve engine efficiency and reduce emissions by optimizing the timing and location of ignition. This model will serve as a key component of simulations that provide new insights into the effect of high-pressure liquid injection, fuel chemistry and turbulent mixing on diesel combustion efficiency and emissions, Hakim said.